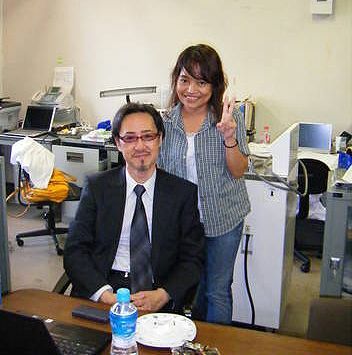 This young Indonesian "scientist" through the years of our contact revealed to me the inner-workings of her "secret" lab at Kobe University and a new BSL-4 in Tokyo that was working on H5N1 and H1N1 viruses, among others. Kobe University does NOT officially have a BSL-4 lab, and yet this microbiologist was assigned by her professor Yoshihiro Kawaoka to work on recombinant H5N1 and H1N1 in a "secret" (her words) lab at their facility. How and why was this allowed to transpire? I have kept our association secret for years, however now that this individual has gone over to the "dark side," and I have decided to reveal everything we discussed in the hope it may stop this ghastly, man-made weaponized virus that is capable of killing millions of innocent people across the world. The Japanese "professors" and "directors" of these nefarious projects preyed upon a young, incredibly naive and inexperienced Indonesian virologists to do their dirty-work. There may be a few repeats, however they are worth noting again as they comprise separate keys to the entire story which is now unfolding and being watched nervously by the world at large. The e-mails will not be corrected for spelling, punctuation or format - and are republished in the original. The graphs and charts accompanied Ernala's e-mails, that are annotated are in bold. Content that was clearly personal was redacted as it does not apply to the case. I'm fine thank you. I have returned to the work again.. Have a trouble here. My supervisor tried to smuggle human samples from Indonesia. The carrier got caught in Surabaya airport without any supporting documents. They marked the sample tubes with 'zoonotic material', but actually it was human RNA. I wanna give up this project if they keep doing illegal things. Somehow I agree with Obama's statement, about swine flu vacination. People should choose whether they want to be vaccinated or not. Vaccine has lot of side effect, lot of death reported because of vaccination. Especially, this vaccine is a new thing, lack of tests and trials. If I had a kid, I wouldn't give my kid swine flu vaccination. Someone can also spread disease by mandatory vaccination. If it happens, this can eliminate US population. Executive Office of the President, U.S. government agencies and 'friends' such as The Boeing Co., have accessed CLG's post, "Kobe University lab creates 'novel' H5N1 in 'secret' lab" by Robert S. Finnegan. Barack Obama's Office accessed the article multiple times, according to CLG website logs. For all those "Me Too" terrorists out there. Yoshihiro Kawaoka has a joint appointment with both Kobe University and the University of Wisconsin. He is one of the lead authors on the controversial paper that was censored by the US government. Note that reports yesterday said he (and the others in the Netherlands) will suspend their research for 60 days. If this is any way, shape or form true - that is the reason the US government has accessed the web site. Because Kawaoka is funded by the National Institutes of Health be looking for a full (and I mean full) NIH investigation at Wisconsin. A full NIH investigation at a university is nearly always a "death" sentence for research there. It involves not only NIH auditors who scrutinize every expenditure ever charged to a federal contract but it also involves a full investigation into animal and human subjects controls as well. This means no one at the offending university can conduct animal or human subject experiments not just the offending investigator. Federal auditors will also (in some cases) scrutinize the training of graduate students, post docs and technical staff in all labs. This is every grant writer/principal investigators worst nightmare come true. It can (and usually does) result in a huge fine for the university and a halt to all federally funded research for at least a year. For you see, the US government does not fund individuals - they fund (and write a legal contract for the research) with universities. Lastly, once the audits results are made public (and they will be) most major scientific journals will begin scrutizing every published article by the investigator going back many years. If (and this is not such a big if) problems are found with these articles, journals will begin retracting these articles. NIH auditors almost always find something because no one is perfect and mistakes happen every day. Researchers have found out what made the 1918 flu pandemic so deadly -- a group of three genes that lets the virus invade the lungs and cause pneumonia. They mixed samples of the 1918 influenza strain with modern seasonal flu viruses to find the three genes and said their study might help in the development of new flu drugs. Kawaoka's work has included a 2007 study in a Level 4 biolab in Canada where he infected apes with the 1918 pandemic virus; and this latest study, where he spliced the 1918 virus with current flu viruses and infected ferrets with various hybrid pandemic/seasonal variants until he came up with a few cocktails that induced severe and often fatal reactions in the ferrets. Of concern to some is the fact that he is messing with gene splicing to begin with, thereby creating new flu variants using the 1918 virus. in September, 2007, Kawaoka was slapped hard for his playing fast and loose with the Ebola virus. In fact, as reported by the AP on September 20, 2007, the National Institutes for Health (NIH) actually suspended Kawaoka's work with Ebola due to inferior lab conditions. re: his work with Ebola: The university (Wisconsin) approved Kawaoka's study initially for a Biosafety Level 3, Klein said. Several of UW-Madison's laboratories are Level 3 labs, but none are Level 4, where the most stringent guidelines to contain the most dangerous pathogens are applied. A Dutch scientist and a University of Wisconsin-Madison virologist whose bird flu research sparked an international controversy are among 39 scientists who agreed Friday to halt their research for 60 days to allow time to assure the public the experiments are safe. Avian flu expert Dr. Yoshihiro Kawaoka and Dr. Gabriele Neumann at the University of Wisconsin-Madison have pioneered a new method (of making vaccines), producing vaccine within cells (rather than embryonic chicken eggs), which will dramatically increase the speed and reduce the expense of making vaccines. FluGen has licensed this technology and is an emerging leader in the development, production, and delivery of influenza vaccines and related infectious disease products. The new method could lead to the need for smaller facilities and means faster production of appropriate vaccines, critical in the event of a pandemic. Initial and ongoing funding for both Dr. Kawaoka’s and Dr. Neumann’s research is provided by the National Institutes of Health. FluGen, founded in 2007, is the emerging leader in the fusion of intradermal delivery and vaccine biology. ...products include FluGen’s live attenuated vaccine candidate, REDEE FLU™ and a novel, vaccine-loaded intradermal delivery technology. Dr. Kawaoka is a co-founder o f FluGen and the Chairman of its Scientific Advisory Board...... establishing a system for the generation and manipulation of influenza viruses known as “reverse genetics” – a development which has revolutionized the field of influenza research. Dr. Neumann is a co-founder of FluGen and a scientific advisor to the company....Her early academic work was instrumental in the breakthrough of “reverse genetics” during her work with Dr. Kawaoka. .... Dr. Neumann also worked on the development of the live attenuated influenza vaccine (LAIV) FluMistTM/CAIV-T at Wyeth. *I have long believed that DNA research has a lot to do with the creation of "the perfect storm" virus which will have maximum lethality and infectious ability, as well as creation of a vaccine to be sold to counteract it; the above fits in with my "theory". Blue, I can understand the gov't following the website and post cited above since they funded the research through the NIH, but why Boeing and other "friends"? Watching to see how much cya would be necessary? This "revelation" is only one aspect of the major disastrous research going on around the globe to create a lethal strain of virus - and the fact that it is financed by the US government is chilling. True, Ruts, but there are folks who avidly follow bird flu all over the world in all walks of life. It simply could be someone from Boeing was interested in the story. Great catch on the Flu Gen! Ha! He's done what so many before him did - took Federal tax dollars to conduct his research, patented either the gene or the process and set up a bogus company so he can sell it to Baxter or whoever for mega bucks! Bet he's not too happy right now! Oh noes.. Did someone Sabotage it? Bird flu experts meet at the World Health Organisation this week to decide how to continue with genetic research that risks creating a catastrophic pandemic. The urgent summit is an attempt to settle a row over the censoring of two studies which show how make a highly contagious mutant H5N1 bird flu virus. The WHO called the 'closed door' meeting, set to begin Friday in Geneva, to break a deadlock between scientists and U.S. biosecurity chiefs. American officials want to censor the work of two research teams, one in the Netherlands and one in the U.S., who have found that just a small number of mutations would allow deadly H5N1 to spread between mammals like ordinary flu. The United Nations health body has said it is 'deeply concerned about the potential negative consequences' if the findings were to make their way into the public domain. GENEVA/LONDON, Feb. 17, 2012 (Reuters) — Two studies showing how scientists mutated the H5N1 bird flu virus into a form that could cause a deadly human pandemic will be published only after experts fully assess the risks, the World Health Organization (WHO) said on Friday. Speaking after a high-level meeting of flu experts and U.S. security officials in Geneva, a WHO spokesman said an agreement had been reached in principle to keep details of the controversial work secret until deeper risk analyses have been carried out. "There must be a much fuller discussion of risk and benefits of research in this area and risks of virus itself," the WHO's Gregory Hartl told reporters. Asked about the potential bioterrorism risks of his and the U.S. team's work, Fouchier said "it was the view of the entire group" at the meeting that the risks that this particular virus or flu viruses in general could be used as bioterrorism agents "would be very, very slim." "The risks are not nil, but they are very, very small," he said. Spoken like a true " Peer Reviewed " brother of the club!!! Of course Fouchier would say that - he has waayyyy too much money on the line to tell the truth.